Thank you to University of Illinois Athletics for sponsoring Weekend Planner. In the mood to take in some college hoops? 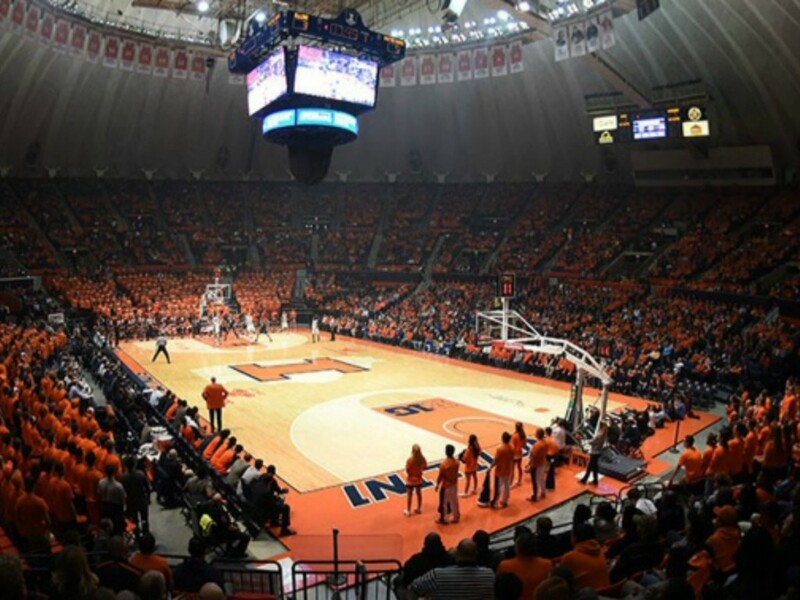 This is the perfect weekend to attend a University of Illinois Men’s Basketball Game! Check out the great deal for the game on Dec. 19 against South Dakota — four tickets plus a $20 concession voucher. When the students are gone, it’s a great time to be at newly remodeled State Farm Center and get up close to the action. It’s going to be a busy weekend for a lot of you. Time to finish up the loose ends on your holiday to-do list. Need some last minute gifts? Check out our Shop Local Guide. There’s still time to get your picture taken with Santa, Go see some holiday lights, and buy a live tree. Need more holiday fun? Our Gigantic Holiday Fun Guide lists all things holiday in CU. Thanks again to University of Illinois Athletics for sponsoring Weekend Planner. When: Saturday, Dec. 19, 8:00 a.m. to 1:00 p.m.
Why you should go: Last market of the season! Get some local gifts for stocking stuffers and a whole lot more. Santa will be in the building as well in case you need to make any last-minute requests. When: Saturday Dec. 19, 11:00 a.m. – 11:30 a.m.
Why You Should Go: Join Barnes and Noble for a storytime and activities featuring How to Catch Santa! When: Saturday, Dec. 19, two showings: 1:00 p.m.- 3:15 p.m. and 7:00-9:15 p.m.
How much: Tickets $4.00. An extra $1 fee applied if purchased online. Appropriate for: Use your own discretion. Common Sense Media recommends this movie for ages 9 and up. Why you should go: For many families, it’s not the holiday season without a screening of this classic film, and what better way to see it than at the Historic Virginia Theatre? It’s A Wonderful Life tells the touching story of Clarence, an angel who helps a compassionate but despairing businessman by showing what life would have been like if he never existed. When: Saturday, Dec. 19, 1:00 – 5:00 p.m.
How much: Special event pricing is $6 members, $8 nonmembers, family 4-pack $28. When: Saturday, Dec. 19 at 2 p.m. against South Dakota; Big Ten opener against Michigan on Dec. 30 at 2 p.m.
How Much: $60 gets you four tickets plus a $20 concession voucher. Prices vary for individual tickets. Why you should go: When the students are gone, it’s a great time to be at State Farm Center and get up close to the action. This family-friendly game time and great deal on tickets (and concessions!) makes this game a win-win for families! When: Saturday, Dec. 19, 7:30 p.m.- 9:30 p.m. and Sunday, Dec. 20, 1:30-4:00 p.m.
How much: UI Students: FREE with valid i-card; Campus Rec Members; FREE with valid i-card; Children ages 3 and under: FREE; Youth ages 4-12: $5; Skate Rental $2. Why you should go: Not one but two opportunities to go ice skating this weekend at the Illini Ice Arena! The University of Illinois Ice Arena will be transformed into a winter wonderland with trees, snow, and lights. When: Sunday, Dec. 20, 3:00 -4:00 p.m.
Why you should go: Join the Jubilee Harp Duo in celebrating Christmas with a Christmas harp recital! Professional harpists Chen-Yu Huang and Molly Madden will perform harp arrangements of favorite Christmas songs in this family-friendly recital. Refreshments will follow. Weekend Planner features only a few of the wonderful events happening in our area. For a full list, please visit our Events Calendar.